Make twelve crepes (per my recipe) and set aside. Combine cheeses, sugar, & vanilla in a bowl. Place cheese filling on one end of crepe and roll up, folding sides in so filling can’t escape and flattening slightly for easier browning. Preheat a pan over medium heat, rub with a stick of butter and add blintzes, cooking about 5 minutes per side until lightly browned. Notes: For my Crepes recipe click here. 12 Comments on "Cheese Blintzes"
What are the ingredients for your mexican wedding cookies? 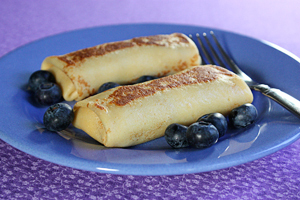 Maybe I am amiss of something but in the blintz recipe ,I do not see how to make the pancake itself? You would use my Crepes recipe (https://www.jennycancook.com/recipes/crepes/) and I have added a note to the recipe above as well, thanks to your question. I love your recipes. They are fabulous. Can I replace Farmer’s cheese with other types of cheese such as Parmesan or mozzarella? It’s not easy to find farmer’s cheese in my country ..Malaysia. Parmesan or mozzarella would not work. It needs to be a white, creamy, spreadable cheese. The closest cheese would be cottage cheese or possibly ricotta cheese. I would drain the cottage cheese over a fine mesh for at least 15 minutes but you could even drain it overnight in the refrigerator. Even ricotta should have any extra liquid drained away. It would be good if you can add some cream cheese to either the cottage or ricotta after draining and better still if you can put it all in a food processor to make it smooth. I would use a mixture of about 80% cottage or ricotta and 20% cream cheese. That’s a good question because it’s not a very common cheese. Farmer’s cheese is like a very dry cottage cheese and the texture is more crumbly than creamy. It makes the best blintzes but it’s not always easy to find. You may have to ask for it at your grocer (my store usually has 2 or 3 packages) but they usually have it at Whole Foods. Do you have the nutritional value for these? 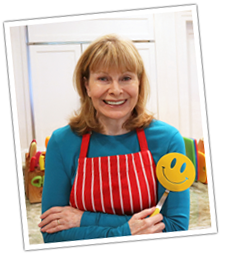 No I don’t – I’m just a home cook who cooks based on healthy ingredients. I know that farmer’s cheese is a low fat cheese.